Notes: Once the concept of the field replicatable shuttle was successfully introduced with the Type 9, Starfleet quickly turned its attention to the next obvious step - that of shuttles and other small craft which would be not only manufactured by individual Starships, but would also be designed by the crews of those ships with no outside assistance. After some consideration Starfleet noted that this development was indeed desirable; it would confer considerable further flexibility to the shuttlecraft fleet while virtually eliminating the need for Starbases and shipyards to engage in shuttlecraft design and construction, freeing further resources for the building of larger vessels. However, Starfleet did recognise that some problems existed; total freedom in shuttlecraft designs would almost certainly lead to an erosion of basic safety standards in at least a few cases, while maintaining an accurate fleetwide picture of the capabilities of the shuttlecraft fleet would become virtually impossible if that composition of that fleet was changing on a daily basis. This would certainly have some implications for the planning and assignments of missions which involve significant operation of shuttlecraft. Starfleet therefore established a 'halfway' policy. Starship crews would be allowed to submit designs to Starfleet and elements of different designs which looked promising would be combined into the next model shuttlecraft. Starfleet hoped that this would promote greater innovation in future shuttle designs while still allowing central control of the designs. Many Starfleet personnel have argued that this system remains too restrictive and that far more could be accomplished if engineering teams within the field where allowed 'off the leash', but thus far Starfleet has remained firm. The Type 10 was one of the first shuttles produced under this new scheme. 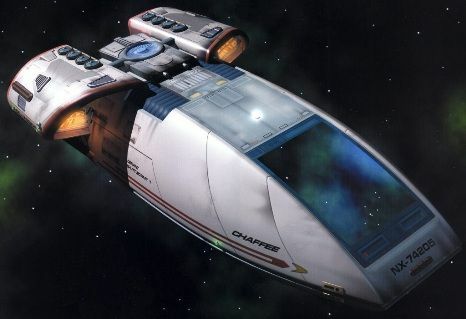 It involves many new innovations; some of the design elements have come from the crew of the USS Defiant, most notably the nacelle and warp core design which is based around that of the Defiant herself and was suggested by the engineering team from Deep Space Nine under Chief Miles o'Brien. Starfleet accepted this concept and after some computer simulation and testing of virtual models, several Type 10 shuttles where produced for field trials. One of these was issued to the Defiant herself; Starfleet reasoned that the role of the crew in designing the shuttle combined with the role of the Defiant herself as a testbed and evaluation vessel made her an ideal choice. The Type 10 has a larger warp coil assembly than most shuttles, which accounts for the very high speeds this design can achieve. The RCS system is identical to that of the Type 6 shuttle. The crew of the USS Intrepid suggested that the design should incorporate bio-neural gel packs, but Starfleet decided that this level of sophistication was not yet warranted. The Intrepid crew responded with a computer deisgn heavily based on that of the Danube class Runabout, but which was also very easy to upgrade to incorporate gel packs. A delighted Starfleet accepted this proposal instantly - it was just the kind of innovation they had hoped would come out of the new design scheme.